Are you fascinated by the YouTube videos and crazy about getting all of them downloaded and enjoying them whenever you want? However, the truth is that the videos on YouTube and other similar online video sharing sites are not compatible with Apple devices, no matter iPod touch 4/5/6, iPhone 6S/6S Plus, or iPad Pro/Air 2/mini 4. As we all know that, most of the videos online is encoded in Flash Video formats, namely FLV format, which is not the video format supported by iPod touch 4. So what video formats it should be? According to the description on Apple official site, the most popular formats used on iPod touch is MP4, MPEG-4, H.264, MOV, MP3. It obviously needs the help of Mac video converter to do this job for you. MacX Video Converter Pro can assist you to download YouTube FLV video directly to iPod touch 4 (iPod Touch 5/6 included), iPhone, iPad on Mac OS (El Capitan/Yosemite). 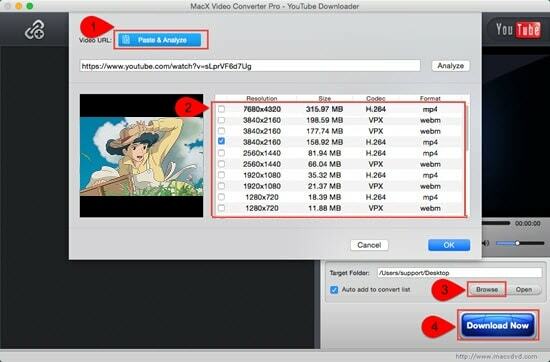 MacX Video Converter Pro works as YouTube downloader and FLV to iPod touch 4/5/6, iPod Shuffle, Nano iPhone, iPad converter on Mac OS as it can free download 4K/HD/SD FLV videos to iPod Touch 4 from YouTube, Vimeo, Dailymotion and 300 more sites. Besides, it converts all HD and SD videos, including AVCHD, M2TS, MOD, TOD that from HD camcorder, MKV, FLV, AVI, Google TV, WebM, etc used widely by online video sites, and other mainstream video formats like WMV, MPEG, F4V, MOV, ASF, VOB, DAT, QT, RM, RMVB, etc to iPod Touch 4/5/6 supported formats, with worldl's fastest speed due to the hardware acceleration tech. The following guide will show you how easy to handle this FLV to iPod touch 4 converter on Mac OS. Free download UHD/1080P/720P FLV videos to iPod Touch 4 (5/6) on Mac (El Capitan) from YouTube, Vimeo, FB 300+ in fast speed and excellent quality. With the assistance of this YouTube FLV to iPod touch 4 converter for Mac, you can download the flash video (.FLV) files from YouTube in a few minutes. The FLV videos can be played by VLC player on your Mac computer or convert and transfer them to your portable devices. First, free download this YouTube FLV to iPod touch 4 converter Mac on your computer. Then look at how to download the YouTube video. After you downloaded this FLV to iPod touch 4 converter, click "YouTube" button, copy and paste the URL of the video you want to convert in the box as the image above. Then click "OK" button. How to Convert Youtube FLV Videos to iPod touch 4, iPhone, iPad on Mac OS X? Associated with the YouTube download feature, this Mac FLV converter allows you to convert downloaded YouTube FLV videos to your iPod touch 4/5/6, iPhone, iPad within few clicks. After the YouTube FLV video is downloaded completely, you need to choose the desired output format. If you would be to convert FLV video to iPod touch 4//5/6, click "to Apple" button first, then click "to iPod" button, choose the profile setting according to your needs. All you have to do at last is to click "Start" button. After the video is converted, open iTunes, click "File" on the main menu. From the drop-down list, select "Add File to Library" or "Add Folder to Library" to put the converted files to the iTunes Library. Then connect your iPod touch 4 to Mac and transfer the converted videos to your iPod touch with the sync of iTunes. 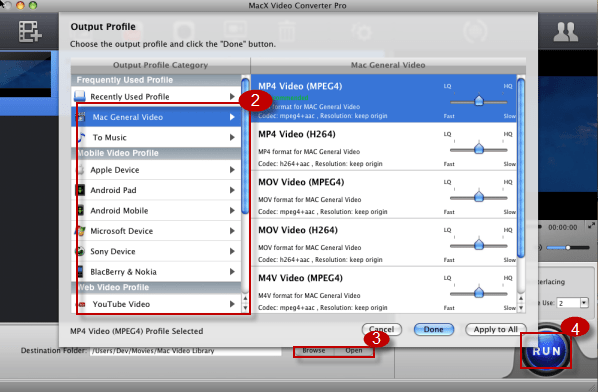 This guide will give you a quick startup on converting AVI to iPod using MacX Video Converter Free Edition, so that you can enjoy AVI video on iPod everywhere. Here's a list of top free Mac video converter for you to convert among HD and SD videos on Mac OS (El Capitan included) for free, like MKV to AVI, AVI to MP4, etc and convert video to iPhone (iPhone 6S), iPad (iPad Pro), iPod, Android. 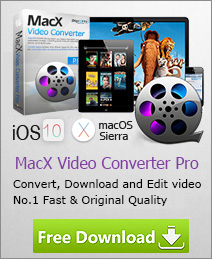 Do not miss this to convert video free with best free video converter for Mac. Get free music downloads for iPod (Touch 4, 5, 6, Nano, Shuffle) without jailbreak here. The best iPod free music downloader, free music download sites, top free song download apps are all gathered here.